Toronto Raptors All-Star Kyle Lowry injured his right ankle when New York Knicks centre Mitchell Robinson knocked him over from behind in the third quarter of the Raptors 128-92 win on Monday night. Lowry, who had just returned after missing two games with a left ankle injury, slapped the floor in pain before being helped up on the play. The guard glared at New York's bench before being helped to the locker room. "I watched the clip," Lowry said after the game. “I think it was a little bit dirty. He grabbed me, pulled me down. He’s a young kid so I don’t know if he did it on purpose or not, but I think he’ll learn his lesson next time and be a little bit more careful." Robinson, who fouled out shortly after the collision with Lowry, took to Twitter after the loss to defend his actions. It's unclear if Lowry will miss time with the injury. 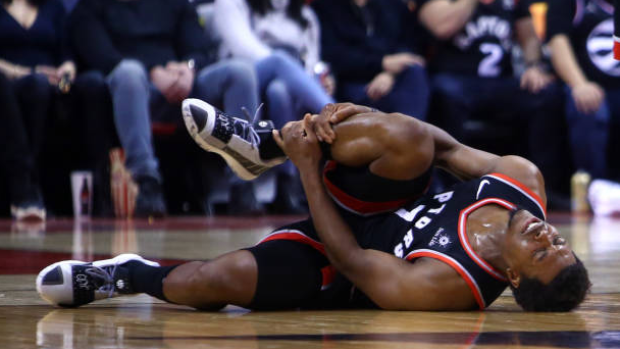 He called his ankle “pretty sore” on Monday, while Raptors head coach Nick Nurse said the injury "was not terribly bad." The Raptors have dealt with injuries throughout the season along with having Kawhi Leonard miss games, including Monday's, due to load management. "It's super frustrating for our team, but we've done a great job of handling everything and playing through the injuries and rest games and trying to keep everyone together," Lowry said. "Everything's been kind of up and down. But we're a good team, and all we need is a couple of games on the floor together and we'll be all right." "Yeah, it's unfortunate," guard Fred VanVleet added. "But I think that is a testament to our team showing what we are capable of. We've had our best player (Leonard) out for almost half the year. Kyle has missed a month (earlier in the season with a back injury). I've missed a month, and it's kind of all going at the same time. The Raptors, who sit second in the Eastern Conference, will visit the Oklahoma City Thunder on Wednesday.